An interesting story in Ramayana connects the famous Govardhan Mountain that Sri Krishna lifted to save the people of Gokul with Hanuman. In the Ramayana, to build the bridge to crossover to Lanka huge stones were required and the Vanara Sena brought huge mountains from different places. By the fourth day of the construction of the bridge, the mountain peaks in South India were leveled. To get more stones, Hanuman flew to the Himalayas. Here he comes across the mighty mountain Dronachala. He decides to lift Dronachala and carry it to the southern tip for construction. But Hanuman is unable to lift the mountain. Soon Hanuman realizes that the mountain is made out of Salagrama, holy black stone with striations associated with Vishnu. Hanuman then prays to the Dronachala Mountain and tells it that He will carry it to Sri Ram who will touch it with his feet while crossing over to Lanka. Dronachala readily agrees. While Hanuman was away in the Himalayas, members of the Vanara Sena brought several other mountains and the bridge was completed. Sri Ram then immediately requested the members of the Vanara Sena to return back. 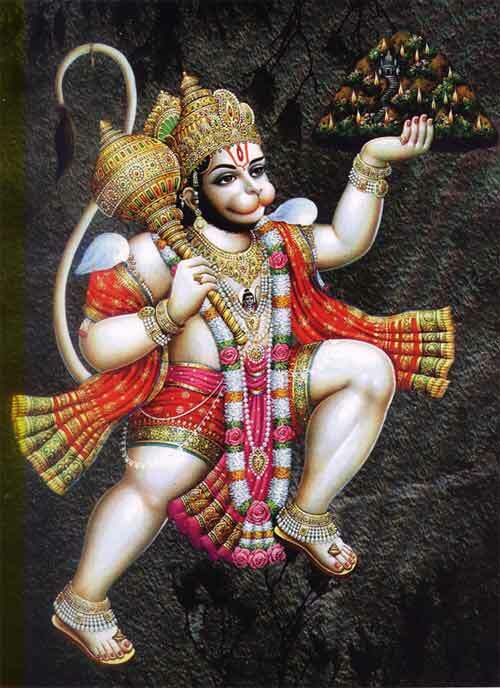 Hanuman came to know about the completion of the bridge when he was flying over Braj region in North India. Hanuman who got the word from Sri Ram regarding the completion of bridge was in a dilemma as he had promised Dronachala Mountain that it will be used in the making of bridge. Hanuman keeps the mountain down in Braj. Dronachala Mountain reminds Hanuman about his promise. Hanuman then flies to Sri Ram and informs about the situation. Sri Ram tells Hanuman that his next avatar will be Sri Krishna and in that avatar he will play around the mountain and will also lift it up. Sri Ram also said that the mountain will be known as Mount Govardhan and will be worshiped by people. A happy Hanuman returns to Dronachala Mountain and informs about its fortune.